…we were set to leave for Chandratal but the Universe had some other plans for me. 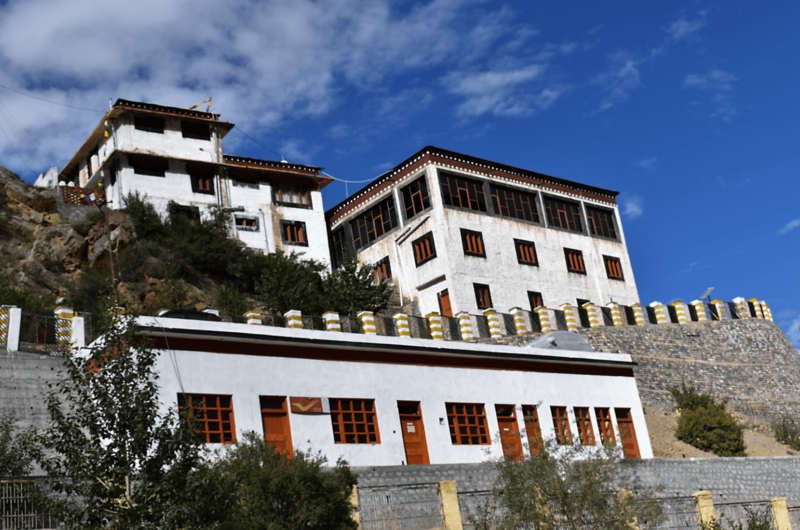 Key Monastery, a beautiful Buddhist temple situated up on a hill, is as old as the 11th century. The box like structures that sit on top of each other is part of the 14th century monastic architecture. The place is of strong historical importance, as it was destroyed several times by different invaders, and even suffered damage due to an earthquake. The Key Gompa as it stands today was last rebuilt and reconstructed in 1975. And how we landed in this magical place, is a story to tell in itself. After spending a wholesome day in Batal, in a makeshift room made of stones, the next morning we could not find any vehicle that would take us to our destination. We found ourselves under prepared thanks to the lie the Internet fed me that there are plenty taxis available for hire at Batal. The truth is, there are none! All the vehicles were either leaving for Kaza, or coming to Batal from Chandratal. After a lot of pleading we finally managed to hitch a ride from a goods carrier going to Lossar. The driver, a tent owner at Chandratal promised to drop us till the lake after picking some things up from Lossar. 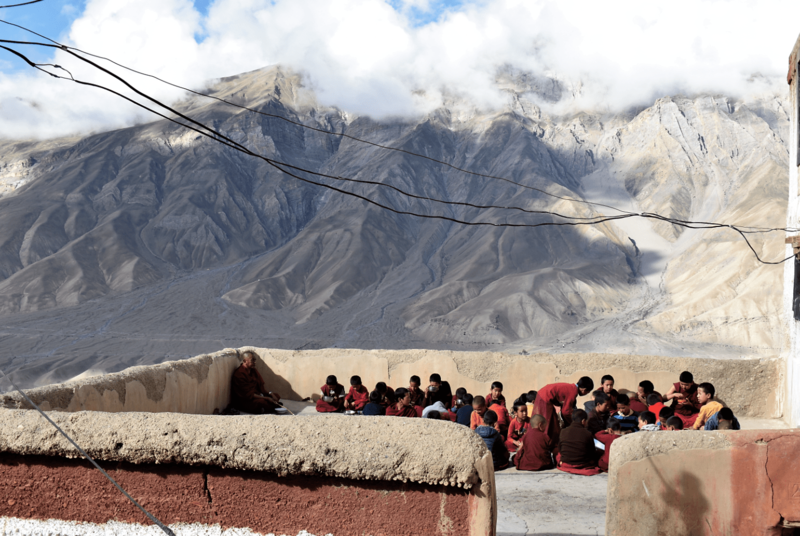 On our way to Lossar, we halted at Kunzum Pass, which is a ritualistic halt for any vehicle passing through that way. The road ahead of Kunzum consists of fifteen sharp hairpin turns, making for a very dangerous ride. Anyone passing through here stops at the shrine dedicated to the Buddhist goddess, Kunzum, to pray for a safe journey on these dangerous roads ahead. The ride till Lossar was about 2 hours long. Since we had found ourselves in that direction, we decided to keep going ahead towards Key Monastery and visit Chandratal while coming back towards Manali. So after relishing a good breakfast under the early morning sun, we hitched another ride till Key Monastery, this time in an Innova! That was perhaps the most luxury I got during my entire 5 days in the valley. Once we were out of Lossar, we found ourselves on a plain land which was supposed to be a road, with nothing but mountains surrounding us on both sides. The mighty barren Himalayas with occasional bushes here and there was nothing short of majestic. 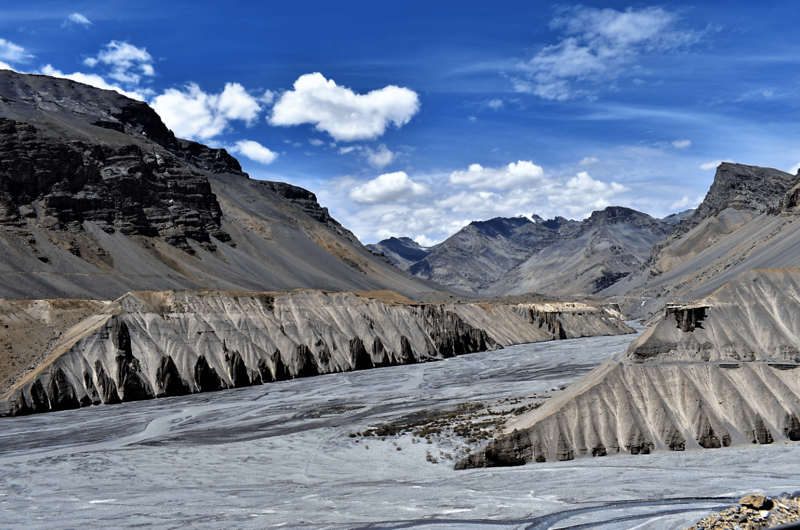 The way silt had made formations on rocks sitting in the middle of the Spiti River, was something I had never seen before- not even on the world wide web! It was so hard to believe that something so symmetrical and beautiful was formed naturally, and was not, in fact, a man made design. We then crossed the Chicham Bridge, supposedly the highest bridge in Asia, and drove through Kibber to finally reached our destination- Key Monastery. With the altitude mountain sickness hitting me mildly, it was a mighty task to even carry my backpack all the way up till the monastery- barely a 10 minutes walk on a gradual incline. After booking ourselves a bed inside the monastery itself, which costs 250 rupees per night, with all 3 meals and tea included, we washed up and head downstairs for lunch. They serve authentic Tibetan food, which did not quite suit our taste pallette. The lunch consisted of some vegetable along with a bread- which to be honest, felt like raw dough. Struggling, I managed to wash down the food I had served for myself with some water. Some people told us that there was a cafe right in front of the car parking of the monastery which served normal food, and thankfully that was our way out of the monastery food. Pro tip: The cafe in front of the monastery also has lodging options which cost almost the same as the monastery, minus the food. It’s a great place to meet fellow travellers! From the balcony of the dorm room in the monastery, the view of the valley is astounding. You can see a few villages from up there including Rangrik, and the peas and barley farms add an interesting touch of colour in the otherwise barren brown land. You can also spot three Buddhist statues from the balcony, not far away from the monastery, led by a dirt road. 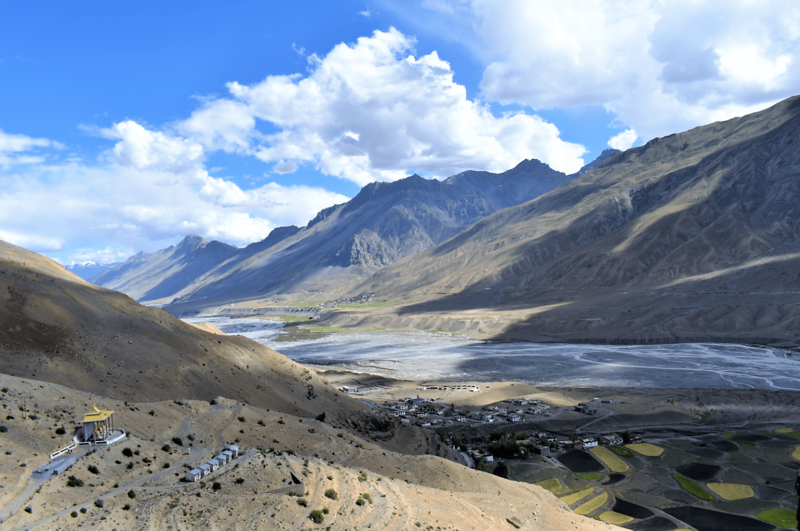 Climbing the hill behind the monastery makes for a great panoramic view of the gompa on top of the hill, seated in the middle of the valley, surrounded by the farmlands and the Spiti river flowing on one side. 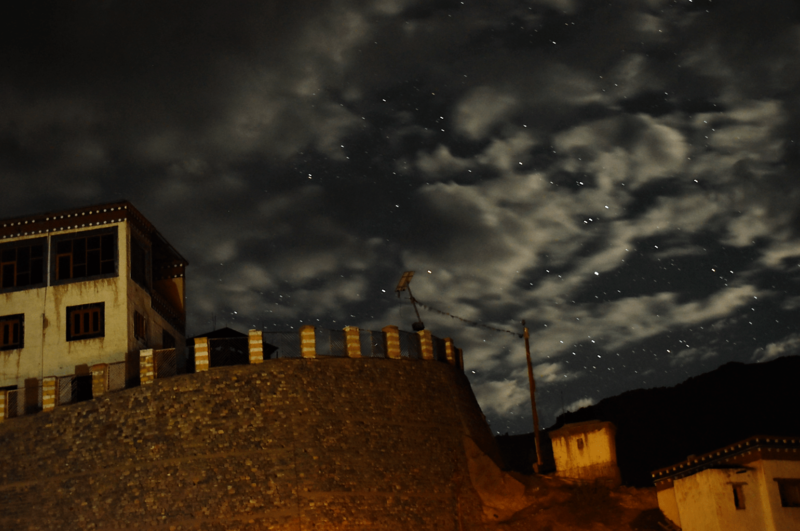 The terrace of the cafe in front of the monastery is also a great spot for shooting astro photographs. 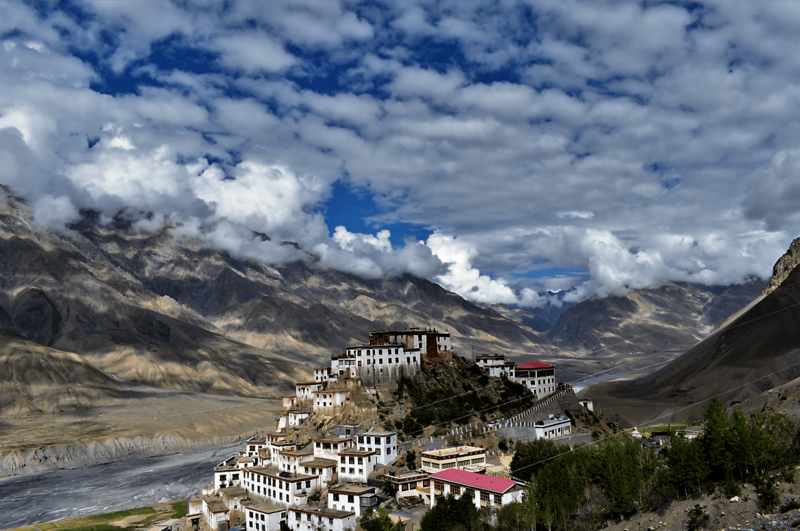 You have just reached the end of the second part of my Spiti series ‘serendipity’. To read the first part, go here. Make sure you join my mailing list to be the first to know when the third part comes out!